Back in 1963, this poem came up in my A-Level GCE question paper. I did not recognise it even though the Paul Robeson record had been played ad nauseam on the radio, and my critique tore it to shreds as simplistic, childish and obvious – I recall saying something really smart like “one can only agree with the penultimate line and the last line is self evident.” Still, I passed the exam, so maybe the marker agreed! The meaning behind the poem is clear. We should appreciate through our reasoning that there is a Power far greater than us that gives us life and happiness. Know that you should be thankful for your life and that you should respect all people and things. There are far too many people who dont know this and wrongly do what suits them without regard for others. Trees was always one of my favorites,so when my son was in the 3rd grade, he asked me to help him learn it for a school class assignment. He learned it quickly, and within an hour,said he like to try it by himself!You can imigine my pride, as he said each line with true expression, but the last two lines brought tears to my eyes, along with the pride, when he said “Poems are made by fools like me, BUT NOBODY !! CAN MAKE A TREE–LIKE–G-O-D ! ! ! I think the poem flowed really well, and I liked the last stanza a lot. My heart can sing again. When ever I hear this poem it paints a picture of the tree and how glorius and beautiful it is. Gods gift to us all. In Elementary school we use to sing trees in the auditorium, It wouild put me in an amazing amosphere because of this poem being so beautiful. Ms. Kilmer must have been in extraordinary amoration to have written such a wonderful poem. I will remember it forever. This is one of the most beautiful poems I have read. As I love trees, particularly natives, this poem has a very special meaning for me. If only more people could relate to and share these beautiful words. My mum used to sing this poem as she did the housework. As a boy it made me think about the wonder of God’s creation. Now I know the wonder of His salvation. During my high school days, the poem that was written by Joyce Kilmer is very nice and excellent. For me, trees serve as the lungs of our planet. Trees also provide cooling shade, block cold winds, attract birds and wildlife, purify our air, prevent soil erosion, clean our water, and add grace and beauty to our surroundings and communities. To improve health and harmony with nature all citizens in the world must plan trees, a tree-growing and tree-caring activities are part of civic duty of every citizen to help in the global challenge to combat climate change and global warning. THIS POEM IS ALL ABOUT HOW TREES ARE IMPORTANT TO US.THAT WE SHOULD KNOW HOW TO CARE THEM FOR EVERY ORGANISM LIES ITS SURVIVAL, ONES FUTURE AND THE NEXT GENERATIONS TO COME. I read the poem ” Trees” in my English literature textbook when I was in junior high. I came across it again when in Music lesson we sang a song the lyric of which is this poem. All the time, I thought the poem is the work of Henry Wordsworth Longfellow until a few days ago when I learned from the TV news that a library in New Brunswick , NJ, was dedicated to Kilmer, who is the author for this famous poem. I am caring for my 94 year old grandmother, who has alzheimers dementia, and when she looks out my window at a lovely weeping pepper tree, she begins reciting parts of your poem. She wasn’t able to recall of the words, so thru a search a found this lovely poem. It isn’t much, but to her, it makes her day, everyday. I loved this poem! Definetly in one of my top favorites! I had always that it was a beautiful poem. But I had an English professor who said that it was a bad poem. She had picked it apart piece by piece and pointed out all of the flaws. For instance, she pointed out how ridiculous it was to imagine the Earth having a breast. But I believe you shouldn’t coldly analyze poetry piece by piece. You should let the poetry take control of your emotions and let it run wild. Then you will feel what the poet intends you to feel. I am a University student asked to anaysises “Trees” in relataion to an essay saying it was a ‘bad’ poem. Personally, i think it is beautiful and the words flow as easily and as gently as the wind blowing through a tree. this poem is in my top 5 fav poems . i 1st herd about this poem from my grandpa when looking 4 a poem 4 a project @ school. i have ben inthralled w/ the poem ever scencce. my fav part is the vary end when Kilmer says poems are written by fools like me but only God can make a tree. This Poem has long been a favorite of mine. I first heard it in school,many years ago. I feel a tree is one of The most beautiful of God’s creations. Each time I look up at one it makes me want to Praise Him. Do you know if there is any source that might still have the music for “Trees”? I would love to be able to get a copy for my granddaughter, a piano student. sorry about the mess up on the other comment!! this is one of my favourite poems ive ever read.it makes me think differntly then the way i used to think of trees. before a tree was just a tree i thought it would be lucky to be a tree.Having all the brids singing and make nest in the branches. It just relax’s me and makes me think of nice places. try to help you, just pour it down the sink. This poem touches my heart so much. It reminds me of my mother who taught me this when I was a child. As I am already a mother, I also teach this to my child. I first heard this poem sung in a commercial years ago when I was 5. I had never forgoten the first lines of this poem. 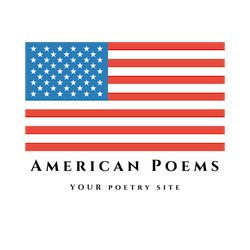 I came across this poem again in highschool on a computer activity. The next time I saw this on my way home to Calamba, it was posted line per line along the with the trees on the highway. I love this poem, I forget from time to time but every time i remember it just overwhelms me. This is one of the most remarkable poem’s ever. It’ll always remind me of going home to Calamba! I learned this poem in grade school. “Trees” on its own is beautiful, we can all appreciate its imagery. Knowing that its author was killed in combat makes the poem and its beauty, “tragically” beautiful, yet sad with the loss of the author’s life. It makes me sad to think of how wonderful our world would be if such people did not die young, but lived their full lives. I remember learning this poem in school when I was very young. It was such a touching poem that I never forgot it. I remember saying the lines from this poem;it seemed to make everything alright and brought a warmth to my heart and tears to my eyes. We are the lucky ones to have such beautiful trees to enjoy. I have been thinking about this poem and I finally found it and will hang it in my home, so I can teach my children and grandchildren what love is. I remember learning this poem in school when I was very young. It was such a touching poem that I never forgot it. I remember reciting the lines from this poem; it seemed to make everything alright and brought such a warmth to my heart and tears to my eyes. We are the lucky ones to have such beautiful creations, which God created for us to enjoy. I have been thinking about this poem for a long time and I finally found it. Now I can enjoy it and teach my children and grandchildren what love is. We all learnt this “off by heart”, as we said then, when I was a kid. So did all the other kids my age in Australia. It’s one of the few poems that I can still recite. Thank you for including it here. I loved this poem, like most, since childhood. It was Alfalfa recitation on The Little Rascals that did it for me. My father also would recite this to my siblings and me. As a child I grew with this poem tatooted on my mind, I would read it everyday when I was about 5 years old, knowing he was a soldier at war but still had the courage to see the beauty of the things around him, I admire his strenght and ability to see things clearly.. I live in a place where there are many trees and every time I hear his poem it makes me smile knowing that I dont live in a time where these trees can only be remembered as pictures on walls or backrounds on photos. This poem will remind me and probably a lot more people about our natures beauty. We should remember we shouldn’t spoil God’s gift for we’re not sure when he’ll take these gifts away.. I’m not sure how anyone could forget such a wonderfully written poem and never remember it again. A POAM AS LOVELY AS A TREE – WOW! Kilmer was a soldier. He fought with valour as a sergeant in the American Expeditionary Force during World War I and saw the horrors of that Great War. Yet he was unbowed. He still knew beauty and lyric, gifts easily lost in war. He wrote this poem, perhaps, as the samurai composed haiku before going into battle. This poem has lasted almost 100 years and still connects with our hearts when we read it. There is a huge Garry Oak near my house that caused me to remember this poem which I had not read for many years. So happy to see it is on the Internet!!! fuzzy piety in their poems. This is true of many Catholics and Kilmer was one. For many, many people religious piety is attractive as a reassuring comfort. did you know that paul robeson recorded this as a song? you’ll never regret listening to it. analysis is unnecessary- it’s all so self-explanatory. Every country has an example of its very own. while looking , relax – then recite the poem and then ponder – you’ll find the Hand Of God. Take It and enjoy the rest of your life. this poem is amazingly beautiful.Can anyone tell me where I can find info to analize it, I need to teach it to my class but I don’t know much about it. I’m in the 8th grade can anyone help? I first heard this poem in high school in New Brunswick, NJ, Kilmer’s hometown, in the early 60’s. For some reason I always remembered the first two lines and the last line! I had forgotten what beauty laid in between. I was stunned by the beauty of this poem when I read it first time. This certainly is, one of the most beautiful poems I have ever read. A wonderful poem! Only a poet like Joyce Kilmer can write such a poem. So I was talking to my mom last night about this poetry project I have to do for English… and my mom suggested I use one my my great, great grandfather. At first I was sort of rude to her, having no idea that he would be famous, and I told her that I would pass on the idea. After telling me I was named after him, She told me to look Joyce Kilmer up on google. Sure enough, I did. And sure, enough, I… Kimberly Joyce Devitt… am the great great granddaughter of Joyce Kilmer. HOW COOL! 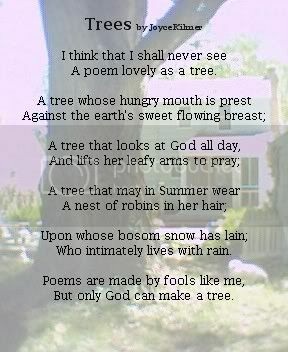 “Trees” by Joyce Kilmer has always been a favorite of mine since memorizing it in grammer school in the early 1940’s. I have also sung it as a vocal solo several times. At that time I had little knowledge of the lasting effects that the thoughts and maxims of the old poets would convey to me throughout my life. We thought then that it was only a task to perform to get a passing mark. Little did we know the lasting effect that the poet’s thoughts would have on our lives. While reading poetry is not my favorite pastime, the poems that we memorized in our youth have been a lasting treasure. Is a beautiful poem. Read it during my schooldays – but remember still the lyrical beauty of the words. Went to visit my grandfather today at a nursing home in VA….he’s 91 years young! He was looking out the window and shared this poem with me. Said he learned it as a young boy in school. I learned it as well! A precious memory for me!! The first time I ever heard this poem was on a Disney movie! Um, I think it is called ‘Melody Time’, it is sung on there. Later that day I heard my husband reciting the poem word for word. It seems that he has loved the poem ever since grade school, when he first heard it, and even though he just barely heard me play the movie for the kids, it sparked his memory of the poem. It really is beautiful! And to hear my husband, as big and gruff as he is, recite such a lovely and flowing poem, is miraculous! this porm was certainley written by joyce kilmer although there may be some similarities to other poems, it is one of a kind. I am pretty sure that this poem is complete. My grandmother, born in 1910 ( 94 and still alive) recites this poem often to me. I have never heard more lines then what is posted here. She has the whole thing memorized and even sings it too! I’m doing a funeral this Friday for aman who loved trees and asked that this poem be read during his memorial service. Can anyone else tell me anything a about this author? Is there another verse beyond what’s in the post? I always thought this was written by Robert Frost? is there another poem that uses the line I’ve never seen a poem as lovely as a tree? We were required to learn this poem in school. I remember it as being written by Longfellow. Did he write one like this?